I have a 2005 honda civic. Note: The a/c compressor seized up and I bought a belt to bypass the A/C. I believe the cooling fan is not working because when it is very cold out (I'm in wisconsin) or when I'm moving over 60 mph the car doesn't overhead... but doesn't always overheat. I have applied 12V to both passenger side and drivers side fans and both work and spin freely when not powered. I have also swapped out the engine coolant temperature switch (twice... once with a duralast and one with an official honda switch). Initially when I turn on the car both fuses are fine. The passenger side fans turns on when I press the A/C button. However, this blows fuse 1 (condenser fan)... but the fan still runs. I can probably assume that pressing the a/c button is what blows the fuse because the a/c compressor has seized thus blowing the fuse. Unfortunately I can't test this at the moment because my arm is too big to reach down in the car and unclip the connector for the a/c power (plans this weekend)... but safe to assume considering if I don't press this button the fuse doesn't blow. I can also verify that the relay works because if I remove the relay (according to the plastic fuse panel diagram I believe I only have 1 relay for both fans) the fan doesn't come on when I press the a/c button. Fuse number 4 for the cooling fan has never blown. I have never seen the driver side fan turn on... ever. Since the a/c button turns on the passenger side fan I'm assuming the drivers side is the cooling fan. 2. why when press the a/c button it blows the fuse but the passenger fan keep moving? 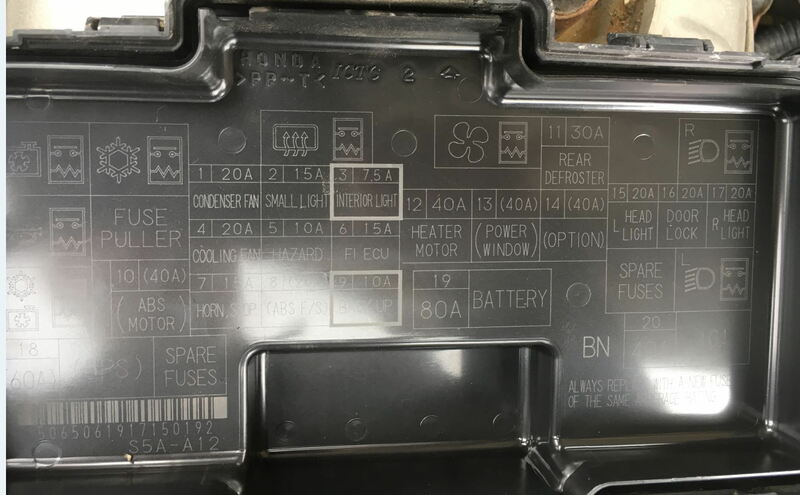 Re: Civic overheating issue... sometimes. help! What do you mean by bypassing the condenser? I think you should replace that but find it odd the fuses keep blowing, it might be electrical in that case or caused by the bypassing you did. Anyway if it overheats it is due to the fan not coming on, if you blast your fans with the AC on and with the heat on max it will keep the car from overheating when you notice the dial creeping up. The fan switch should have fixed it though as that's usually the problem, I've gone through two now. Last edited by Zigory; 04-03-2019 at 04:46 PM.